Location: Syzran Samara Oblast, Russia. Notes: The Syzran Kremlin is located in the Russian town Syzran Samara Oblast, on the Kremlin hill at the confluence of the Volga, Syzranka river, Krymza river, overlooking the main historic street «Soviet». 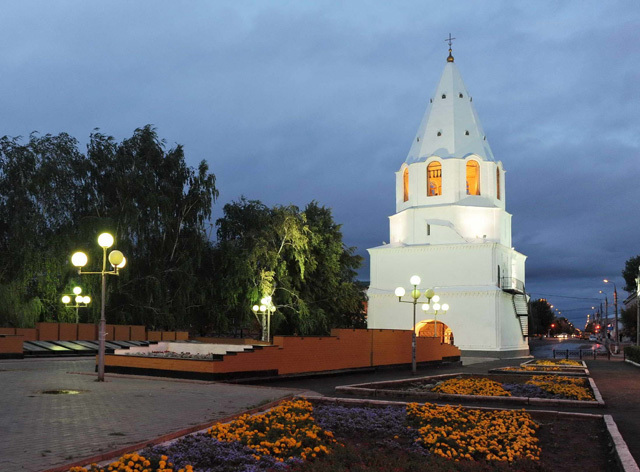 (another called «Biggest street») The preserved «Spaskaya tower» of Syzran Kremlin is the embodiment of old Russian architecture. The only Kremlin in the Samara Oblast. Has survived only «Spasskaya» Tower». The Kremlin also houses the Church of the Nativity (1717). In 1683 construction began on the fortress of Tsar Peter the Great I, directed the construction of Governor G. Kozlowski. «Spasskya Tower» was first portal, but then its redesigned and built inside the church in the name of the Savior. Participated in the fighting just once. Currently, the museum inside the tower Syzran Kremlin.